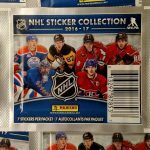 Even though they lost their license to make NHL trading cards, Panini is soldiering on with their annual hockey sticker set for 2014-15. I probably won’t collect this year’s sticker set, but I’m still glad it came out. 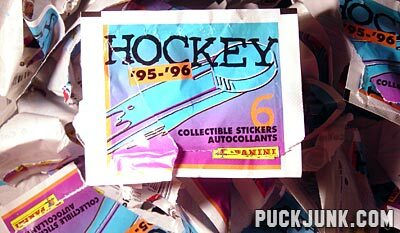 Panini has made NHL sticker sets since 1987-88, and it is nice to see that trend continue. Plus, this gives people a choice if they don’t want to collect any of Upper Deck’s offerings. A pack costs $1.00 and has seven stickers. There are 500 stickers in the set. I recently bought a pack to see what this year’s set was like. 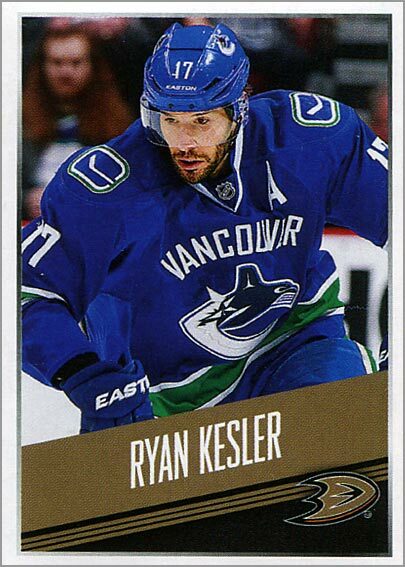 #238 – Ryan Kesler – The stickers measure 1 15/16″ wide by 2 3/4″ tall. 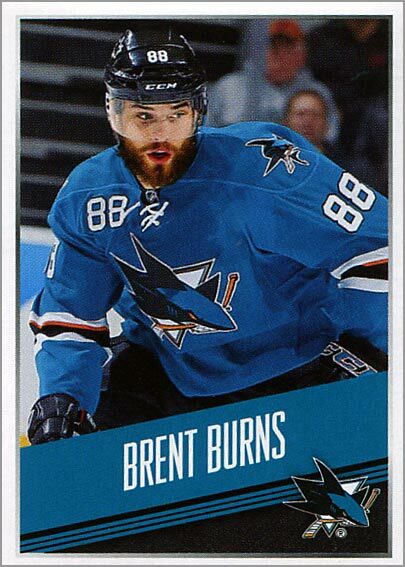 #374 – Brent Burns – Each team gets 12 player stickers. #119 – New York Islanders logo & 287 – Colorado Avalance logo – It wouldn’t be a Panini sticker set without shiny logo stickers, now would it? Good to see that the shiny logos are in this year’s set. 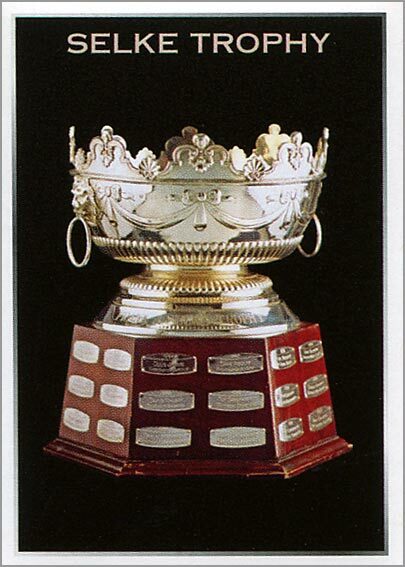 481 – Selke Trophy – Panini issued stickers of the trophies, looking all regal and serious on a black background. There are also stickers of the award winners themselves. 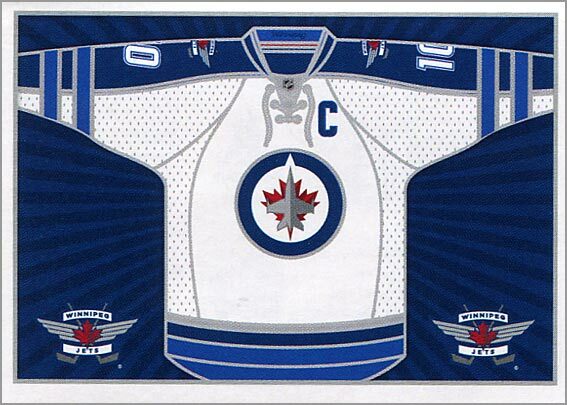 411 – Winnipeg Jets Road Jersey – Each team gets two jersey stickers — one for the home jersey and one for the road jersey. Panini did something similar in their 1988-89 hockey sticker set. Too bad the socks aren’t also shown on these stickers. 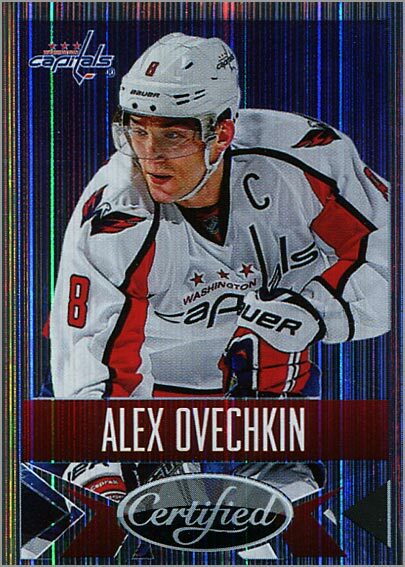 218 – Alex Ovechkin – What the…Certified?!?! I guess Panini used some of their trading card set logos on their stickers. Each team’s top star is printed on shiny foil stock, and adorned with the “Certified” logo. There are nine rookie stickers too, which have “Rated Rookie” logos on them. That’s funny, since Panini didn’t use the “Rated Rookie” logo for the last three years of their contract to make hockey cards. Plus, there are stickers about the Winter Classic, Stadium Series and 2014 Playoffs. 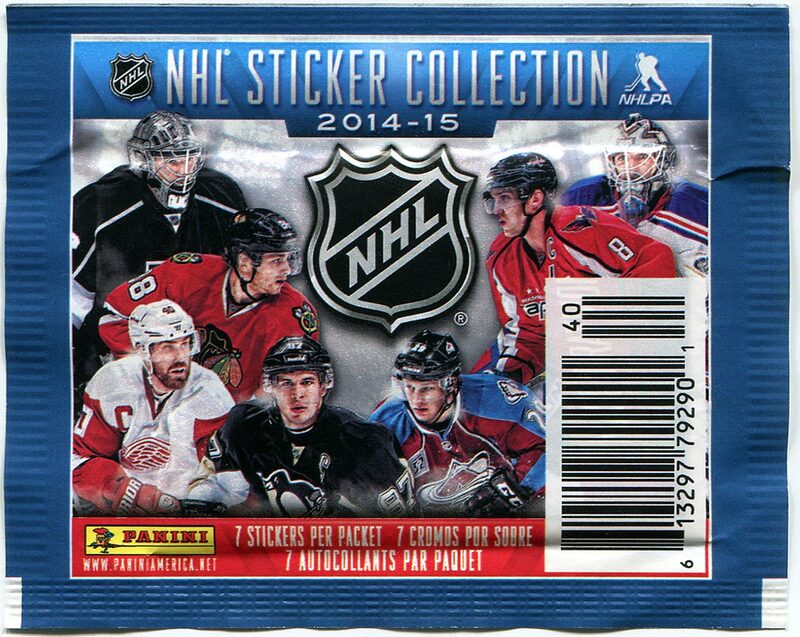 What I like about 2014-15 Panini Hockey Stickers: You get seven stickers per pack. Sure, the stickers are smaller than usual, but I’d rather have more stickers at a slightly smaller size than less stickers that are nearly-card sized. There’s a lot of variety in this year’s set, too, with logos, jerseys, trophies, outdoor game recaps, playoff game recaps and rookies. And there’s something satisfying about sticking that last sticker to complete a page in your sticker album. 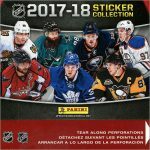 What I don’t like about 2014-15 Panini Hockey Stickers: At $1 per pack and with 500 stickers to collect, putting this set together becomes an expensive proposition. 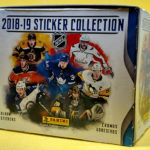 You’d need 72 packs, assuming you get no doubles — BUT YOU WILL, BECAUSE PANINI HOCKEY STICKERS HAVE THE WORST COLLATION EVER! That means you’ll probably have to order the 50 or so stickers you end up needing online via their convoluted, poorly translated web order form. (I warned you).